KATHMANDU, Jan 10: The benchmark equity index started Wednesday's trading with a steady advance in the morning. The Nepal Stock Exchange (Nepse) index added as much as 6 points by mid-session. Stocks came under pressure thereafter and pared most of its initial gains in the latter trading hours. Nonetheless, the index posted a modest gain of 2.29 points to close the day at 1,179.36 points. Despite the day's gain, the index has continued to trade between a confined range, suggesting lack of conviction in the market in the present context. Subsequently, the market turned in another bland trading session. The bourse posted a below average turnover of Rs 348 million on the day. Most of the sectors posted moves to the upside contributing to the index's advance. Among gainers, Development Bank and Hydropower sub-indices registered gains of 0.57 percent and 0.56 percent, respectively. Sub-index of Hotels, meanwhile, climbed 0.32 percent. Slight strength was also visible among Banking, Microfinance and Life Insurance scrips as the respective sub-indices posted modest gains on the day. Conversely, only 'Others' and Finance sub-indices edged lower. 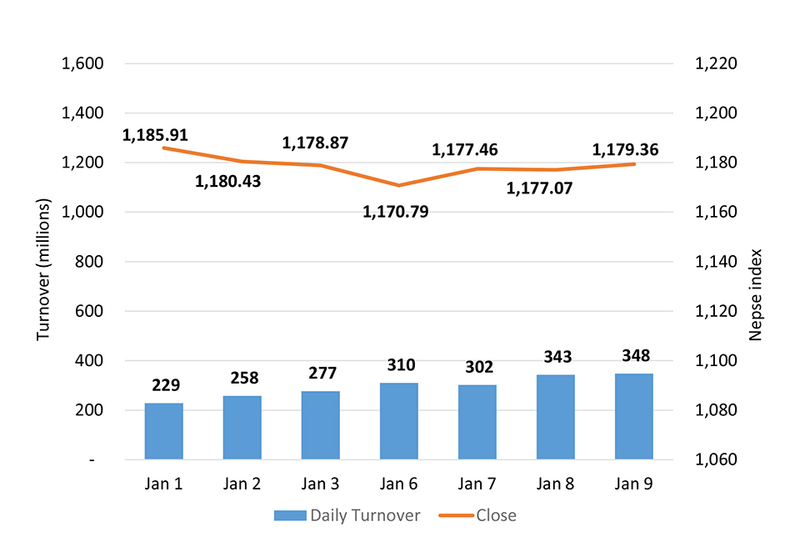 In terms of market activity, Chhimek Laghubitta Bikas Bank Ltd Promoter Share logged in the highest turnover of over Rs 58 million on the day. Nepal Bank Ltd's shares also remained active with turnover of over Rs 48 million. NIC Asia Bank Ltd and Prabhu Bank Ltd registered transactions of Rs 16 million and Rs 14 million, respectively. Nepal Life Insurance Company Ltd, Bank of Kathmandu Ltd and Nepal Credit and Commercial Bank Ltd were among other top turnover scrips on Wednesday. Bhargav Bikash Bank Ltd led the list of gainers as it saw its share price jump 5.97 percent. Similarly, shares of Himalayan Power Partner Ltd climbed 5 percent. Himalayan Distillery Ltd, Ngadi Group Power Ltd and Miteri Development Bank Ltd followed suit with gains of 3.97 percent, 3.15 percent, and 2.79 percent, respectively. Panchakanya Mai Hydropower Ltd, Kalika Laghubitta Bittiya Sanstha Ltd and Dibyashwori Hydropower Ltd were among other top advances on Wednesday. On the other hand, shares of Hathway Finance Company Ltd struggled and shed 3.2 percent on the day. Meanwhile, Sanima Equity Fund's unit price tumbled 2.59 percent. Additionally, shares of ICFC Finance Ltd, Saptakoshi Development Bank Ltd, Kisan Microfinance Bittiya Sanstha Ltd and Nagbeli Laghubitta Bikas Bank Ltd fell over 2 percent apiece. On the corporate front, Arambha Microfinance Bittiya Sanstha Ltd, convened its Annual General Meeting (AGM) on Tuesday. The micro sector lender will be issuing 70 percent right shares to its shareholders following the approval from the meeting. As per the ARKS technical analysis, the market formed a small bullish candlestick on the daily timeframe. Nonetheless, the market is still in the consolidation phase indicating indecision among investors. Technical indicators also suggest neutral momentum in the current juncture with possible movements in either direction likely. Hence, a breakout above 1,180 points with significant volume might present a buying opportunity for investors.